HARTFORD, Conn. (AP) — A Brazilian man who worked as a paralegal at a Stamford firm that specialized in immigration law has pleaded guilty to document fraud. Federal prosecutors say 56-year-old Fernando Goncalves knowingly filed fraudulent visa applications for foreign nationals. In the cases of eight clients, Goncalves allegedly submitted applications containing false statements and fraudulent documents. Authorities say each of the clients paid him more than $7,000. Goncalves pleaded guilty on Tuesday in U.S. District Court in Hartford. He faces up to 10 years in prison. He has been detained since he was arrested in June at John F. Kennedy International Airport in New York after returning from a trip to Brazil. Greg Harrison, a Greensboro businessman who operated a series of staffing companies over the past two decades and went on to finance two feature-length films, has been sentenced to 12 years in federal prison and ordered to repay $43.3 million as restitution to the US government related to his conviction last December for tax fraud. Harrison, who maintains his innocence, publicly apologized to his family, including a daughter born two weeks earlier, describing personal tragedy and hardship at the time of his arrest, and defending his record as a businessman in remarks to US District Court Judge James A. Beaty Jr. before his sentencing on Sept. 5. “I’ve put them in a terrible position; they’ve depended on me,” Harrison said in a halting voice. “I’m extremely hurt by what’s happened to my family and also to those employees. “I hope that my legacy is not defined by these incidents,” he concluded. The judge said he would recommend that Harrison be housed at the facility closest to his family, likely FCI Butner, a low-medium-security federal prison. Assistant US Attorney Frank Chut asked the judge to sentence Harrison at the high end of the sentencing guidelines. “This is an enormously serious offense involving $43 million that belonged to the people of the United States that was converted to this man’s personal use for his lifestyle,” Chut said. Houston lawyer, Joe Phillips, walks out of the Bob Casey Federal Courthouse Thursday, June 14, 2012, in Houston. He and his wife are accused of stealing $2 million from two dozen veterans in another pending case described as the largest rip-off ever reported in the VA fiduciary program. 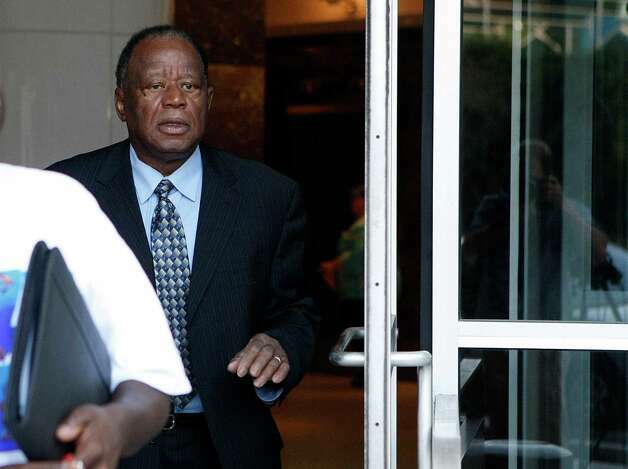 HOUSTON — A 73-year-old attorney pleaded guilty in Houston federal district court Tuesday to conspiring with his wife to steal $2.3 million from 49 disabled veterans and then hiding the thefts by creating fake reports, imaginary bank accounts and filing a bogus income tax return. As part of his guilty plea to two of 21 charges against him, Joe B. Phillips admitted to transferring more than $1.36 million from veterans clients’ accounts directly to a joint checking account that he shared with his wife between 2003 and 2007. Phillips’ wife Dorothy, 72, a self-described gambling addict, pleaded guilty to similar charges in April and admitted to misusing some veterans’ money to fund casino trips to Louisiana, where she often gambled at the Auberge du Lac and Delta Downs, court records show. But Joe Phillips, 73, had insisted on his innocence until Tuesday — minutes before jury selection for his trial was to begin and after his attorneys warned him in open court that his wife’s admissions to the couple’s conspiracy had damaged his defense. During that same period, the couple withdrew a similar amount in cash, sometimes from ATMs inside casinos on gambling trips. He also acknowledged signing false accounting statements and a bogus income tax return. Phillips was one of a handful of fiduciaries investigated by Hearst Newspapers as part of story in July. He has remained free on $100,000 bond since first being charged in 2010, is expected to be sentenced in December. He refused comment. Judge Lee H. Rosenthal warned Phillips that he faced a maximum eight-year sentence for the two charges; a fine of $500,000 and restitution of at least $2.3 million, based on the governments estimates of veterans’ losses. But Rosenthal told Phillips that he and his wife could face an even tougher sentence because of the number of victims, their vulnerability and the amount of losses. Rosenthal promised the upcoming pre-sentence investigation will re-examine the veterans’ losses, which Phillips has claimed are less than government estimates. The VA has never released a complete list of the amounts each individual veteran lost, first discovered in a 2007 audit. Though some victims have since been compensated by the federal government, others whose assets were overseen by Phillips and their families have told the Chronicle they have never been contacted. Phillips worked for the VA for several years and since the 1980s has dedicated most of his law practice to working with disabled veterans; his wife was his legal assistant. The couple reported an annual income of $100,000 to $145,000 in 2004-2007, lived in a modest house and drove a Lexus, according to the indictment and a recently bankruptcy filing. Beginning in the early 1980s, Phillips won approval to manage benefits and assets for as many as 50 disabled veterans at a time as both a VA fiduciary and a payee under the Social Security Administration. In both roles, he received disabled veterans’ benefit checks and also managed veterans’ bank accounts and spending. In at least 28 cases, probate courts also appointed him to oversee veterans’ estates and over the years he also was appointed to dispose of dead veterans’ assets. During my 25-year California teaching career, I had considerable first-hand experience with newly married couples (involving the K-1) who enrolled in my English as a Second Language classes. The typical profile was a middle aged or older male with a non-English speaking much younger female who had never been to the United States. They “met” through one of the thousands of Internet dating services that hook up foreign-born women eager to come to America with men looking for a second or third chance at love. These marriages of convenience pair someone willing to trade her affection for a green card with someone gambling that his new relationship will somehow work out. Most, however, don’t. The sentences concluded a lengthy ICE investigation. But get this. Manny is a former private immigration lawyer who practiced in Chicago; his brother worked in the same office. Manny was sentenced to 24 months in jail and a $10,000 fine; Marc 12 months and $10,000. The brothers both pleaded guilty to conspiracy to commit marriage fraud. In addition to jail time and the fines, the U.S. Department of Justice formally barred Manny Aguja from ever practicing immigration law. A disbarred Aguja may be the best news of all. Read the U.S. District Court, Northern District of Illinois, Eastern Division documents here. Whenever scam artists who specialize in marriage fraud are exposed, I consider it a step forward toward what I hope will be the eventual re-evaluation of the dozens of visas including the K-1 that have not only outlived their usefulness but also lead to abuses that harm everyone. involved. Detective said he noticed that the suspect quickly closed her laptop during a traffic stop and then found a stack of TurboTax debit cards in her purse. The names belonged to people in a Bradenton assisted living facility. A police officer with Bradenton’s gang unit turned an easy drug arrest into what may be a major white collar crime arrest involving tax fraud and residents of a local assisted living facility. Det. B. Pieper from the police department’s gang unit put together the case by paying close attention during a routine drug bust. Nikki Brydson, a 40-year-old cafeteria worker at Ballard Elementary, was arrested on the first day of school and charged with scheming to defraud. Her arrest was the culmination of months of work that began with a simple drug bust last spring. Pieper was one of several detectives watching traffic coming to and from a house where police suspected drugs were sold. He said he and his partner watched a car leave the house and then run a stop sign. When they pulled over the car Brydson was in the passenger seat with a laptop and a bag of marijuana on her lap. Brydson quickly closed the laptop, which made Pieper suspicious. When he searched her purse, he said he found several TurboTax debit cards with different names on them. He also noticed a 60-step instruction sheet on how to perform tax fraud through TurboTax. The detectives brought Brydson back to the department where they questioned her about the tax computer, the debit cards and the instruction sheet. She also had a list of names, all residents from Langdon Hall Assisted Living Facility. Pieper said that Brydson told him another woman asked for her help in the scam. While police believe another person may have been involved, Pieper said Brydson was definitely a partner in the crimes and that she had even filed a tax return in her own mother’s name — keeping the refund for herself. Pieper tracked down the first few names on the list to Langdon Hall and discovered that the managers had fired two people who were suspected of stealing personal information. Pieper talked to the residents and in some cases their family members. One woman from Boston called Pieper and told him she had been wondering why her father never got his tax refund. Pieper put together enough information to arrest Brydson last month and has turned over his findings to the state attorney’s office where he said the agency can issue subpoenas to get a better idea of just how much money Brydson and her group was able to get in tax refunds. Pieper said the case may go about $20,000. UPDATED at 5 p.m. with reaction from attorneys. EAST ST. LOUIS • Alton lawyer Dennis Nalick apparently committed suicide Thursday rather than face sentencing in a federal criminal case, according to authorities and one of his lawyers. Nalick sent a fax to his lawyers office at 8 a.m. saying he wouldn’t be at a 9 a.m. sentencing hearing in federal court here. After he failed to show up, U.S. District Judge Michael Reagan issued a warrant for Nalick’s arrest. One of Nalick’s attorneys asked authorities to check on Nalick’s well-being, and his body was then discovered in his SUV, parked inside his detached garage in Edwardsville with the motor running. He was pronounced dead at 11:07 a.m.
Madison County Coroner Stephen P. Nonn stressed Thursday afternoon that the autopsy and toxicological testing had not been completed and Nalick’s cause of death had not yet been officially determined. Nalick pleaded guilty of one felony count of mail fraud in January, admitting that he’d deposited a client’s $137,826 check into his own account and spent it. Prosecutors said that Nalick took a total of $496,000. Nalick and his lawyers would have argued Thursday that the loss amount was less than $400,000. At the time of his plea, Nalick knew under federal sentencing guidelines, he could face 41 to 51 months in prison and would have had to pay back the victims. Thursday afternoon, Nalick lawyer Chris Threlkeld said that the case would be dismissed due to Nalick’s death before sentencing. Alton lawyer Robert D. Larson, who has represented two of Nalick’s victims, was not optimistic that any of the victims would get all their money back. Although at least some have filed claims with the Illinois Attorney Registration and Disciplinary Committee, there is a $75,000 limit on payouts from the client protection program, said IARDC chief counsel James J. Grogan. Nalick had a history of disciplinary proceedings in both Missouri and Illinois and was suspended from practicing law a year ago. Several lawsuits have also been filed against banks that cashed checks with client signatures forged by Nalick, Larson said. TAMPA, Fla. — A Houston lawyer was sentenced to 18 months in federal prison and 36 months of home confinement Thursday, Aug. 9. This case was investigated by U.S. Immigration and Customs Enforcement’s (ICE) Homeland Security Investigations (HSI) Tampa and the U.S. Secret Service’s Tampa and Newark, N.J., field offices. According to testimony and evidence presented at trial, from February 2005 through July 2006, Roger Shoss, 67, of Houston, and codefendant Nicolette Loisel, also a Houston lawyer, conspired to steal the identities of dormant, publicly-traded companies. They then used the corporate identities they had stolen to create fraudulent, empty-shell companies that had the appearance of being publicly traded. They subsequently sold the fraudulent empty-shell companies for a profit. The four companies featured in the indictment were Mobilestream Inc., Regaltech Inc., Nanoforce Inc. and Rocky Mountain Gold Mining Inc., which emanated from 3E International Inc., Pacific Chemical Inc., Webgalaxy Inc. and Greensmart Corporation, respectively. The administrative and money laundering functions of this scheme were headquartered in Pinellas County, Fla. Multiple wire transfers, totaling at least $800,000, were initiated from the Middle District of Florida to Shoss, in payment for the companies. Shoss, in turn, paid Loisel more than $450,000 for her role in the scheme. In addition to his prison sentence, Shoss is required to pay a final forfeiture money judgment, in the amount of $800,000. This amount represents proceeds obtained by Shoss and Loisel as a result of their criminal activities. A final order of forfeiture was also entered for Shoss’ residence in Houston, which was purchased with proceeds traceable to the wire fraud conspiracy. A federal jury found Shoss and Loisel guilty of conspiracy to commit wire fraud on May 22. Loisel’s sentencing is scheduled for Sept. 4. The Durant Fire Department Shows off firemen in their uniforms for senior citizens during a “Fraud Fashion Show” at the Senior Fraud Conference Wednesday morning. Senior Citizens in the Durant area were invited to an anti-fraud conference Wednesday morning. The conference was held by the Oklahoma Insurance Department (OID). The conference began with breakfast served at 8 a.m. and presentations started at 8:30 a.m. According to Oklahoma Insurance Commissioner John Doak, the rising amount of fraud cases make it clear that the OID needs to educate senior citizens. This is the first year the department has held these conferences but Doak said he anticipates doing more next year. Doak began the presentations with an overview of the types of fraud seniors need to be aware of and ways to safeguard against scammers. According to Doak, insurance fraud is the number two leading white collar crime in America, beat only by tax fraud. Seniors learned how insurance agents can scam them and how they as the customer can prevent and stop the scam. Seniors were also informed about funeral scams. When an individual pre-pays for a funeral so that the individual’s family does not have to, they become vulnerable to a scam. Seniors were taught that scammers count on the fact that there will be no witness to the scam once the victim is deceased. They were advised to keep all paper work and inform family members of the transaction. Seniors were also informed about investment fraud and Medicare fraud. They were given warning signs to look for such as unexpected home visits. Division Director of the Health Insurance Counseling Program for the OID Ray Walker said Medicare does not come to your home. Seniors were also told that scammers use telemarketing often. They were informed about how to be placed on “Do Not Call” lists. When placed on the “Do Not Call” list the only organizations who should call are political, charitable organizations or organizations wishing to set up a face-to-face meeting. No soliciting is permitted. According to Tom Bates from the Oklahoma Attorney General’s office, most legitimate businesses comply with the “Do Not Call” list, so a soliciting call would be the “ultimate red flag” if you on this list. Seniors were told that scammers using telemarketing rely on the politeness of their generation. “You don’t have to be polite to these people. You can just hang up,” said Walker. In this scam a person will call a senior citizen in the middle of the night and pretend to be a distressed grandchild. They will attempt to coax the grandparent into sending “emergency” money. Seniors were warned to be wary of such calls and not reveal information but make sure it is their grandchild first. The conference also consisted of a “Fraud Fashion Show” in which police, the fire department, and agents from other well-known entities showed their uniforms. Each agent explained why they would be at a residence and what to expect from a legitimate visit. “The Fraud Fashion Show has been a big hit” said Doak. Seniors were also given contact information for most of the entities as well as for the OID anti-fraud unit. “If you think it’s fraud, call us,” said Walker. The phone number for the OID anti-fraud unit is 1-800-522-0071. They can also be reached by email at fraudstoppers@oid.ok.gov. Voters expect Mitt Romney to blow the whistle in the debates. If Mr. Obama’s debate performance mirrors his campaign, Mr. Romney’s prediction will be dead on. To get a sense of how comprehensive the president’s assault on the truth has been, consider some of his false claims in recent speeches and ads. That claim has been thoroughly discredited, including by PolitiFact Virginia and editorials in this newspaper. Mr. Romney, unlike the president, is committed to cutting taxes for everyone, including the middle class. Another ad says, “As a corporate raider, [Mr. Romney] shipped jobs to China and Mexico.” In response, the Washington Post editorialized, “On just about every level, this ad is misleading, unfair and untrue.” As recently as Sept. 17, Mr. Obama claimed in Ohio that Mr. Romney’s “experience has been owning companies that were called ‘pioneers’ in the business of outsourcing jobs to countries like China.” But that claim, too, is a fabrication. There is more. An Obama ad aimed at northern Virginia women intones, “Mitt Romney opposes requiring coverage for contraception.” In fact, Mr. Romney opposes the president’s unprecedented assault on religious liberties—in this case, the federal government forcing religious institutions (like church-sponsored hospitals, schools and charities) to provide insurance coverage for contraception in violation of their fundamental moral values and, incidentally, the First Amendment. Candidates always have disagreements, arguing over the meaning of events or evidence. But Mr. Obama has taken ordinary political differences beyond anything we’ve seen. Every day, it seems, he attempts to disqualify his opponent through deliberate and undeniable falsehoods. This is only one side of a two-sided coin. The president can’t tell the truth about his own record either. For example, Mr. Obama said at a Univision Town Hall on Sept. 20 that his biggest failure “is we haven’t gotten comprehensive immigration reform done.” The president then did what is second nature to him: He pinned the blame on Republicans. The problem with this excuse is that the Democrats controlled Congress by huge margins in the first two years of his presidency—and Mr. Obama never introduced an immigration bill or even provided the framework for one. The most troubling recent example of Mr. Obama’s serial dishonesty is his administration’s effort to deny that the attack on our consulate in Benghazi was a premeditated terrorist assault, as if the truth would somehow tarnish Mr. Obama’s foreign-policy credentials.